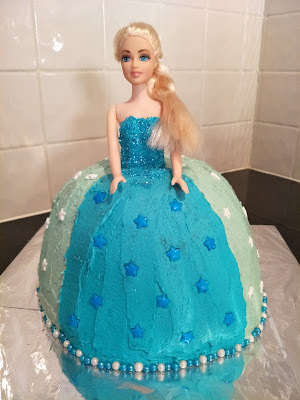 I've made this Elsa birthday cake minimal-stress by sourcing a doll from a local toy shop that I was happy to cut the legs off (if need be), taking a trip to the supermarket first to see what decorations were readily available rather than wasting time hunting down hard to find decorations, and using balls at the bottom of the skirt to hide any messy joins between the icing and the cake-board. I've also stayed away from using ready-to-roll icing for the bodice to limit the types of icing I needed to work with (and colour). For the full instructions on how to make my minimal-stress Elsa Frozen cake, be sure to check out my article on My Kid Craft. My little girl adored this cake - I hope yours does too!